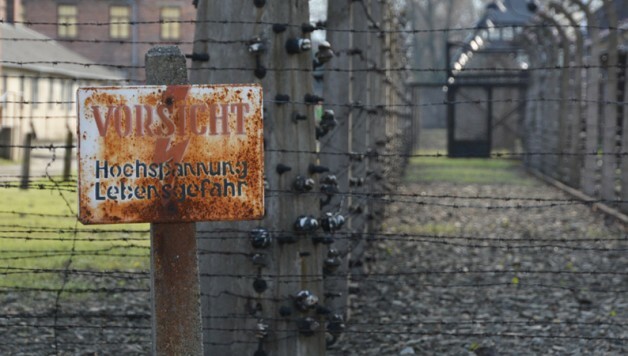 – Auschwitz was actually more than one camp and was made up of over 40 smaller camps as well. 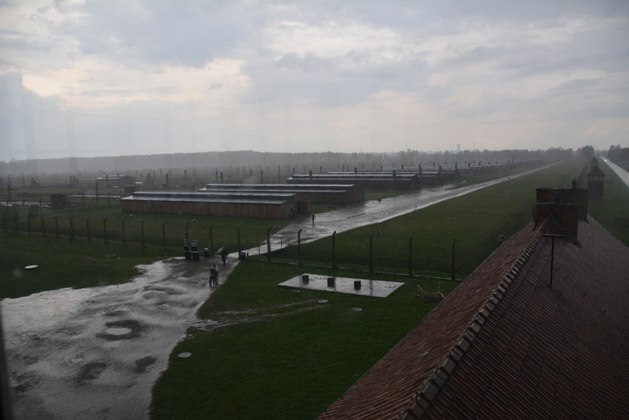 However, the majority of prisoners were kept at and/or died at one of the two large camps: ‘Auschwitz I’ and ‘Auschwitz II’. Auschwitz II is also known as Birkenau, and from now on I will refer to ‘Auschwitz I’ as just ‘Auschwitz’ and I will refer to ‘Auschwitz II’ as ‘Birkenau’. – The first prisoners arrived at the camp in May of 1940, and the camp was liberated by the Russians in January of 1945. – Around 1.1 million people died at Auschwitz and Birkenau. 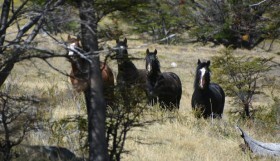 Most were killed within an hour of their arrival at the camp. 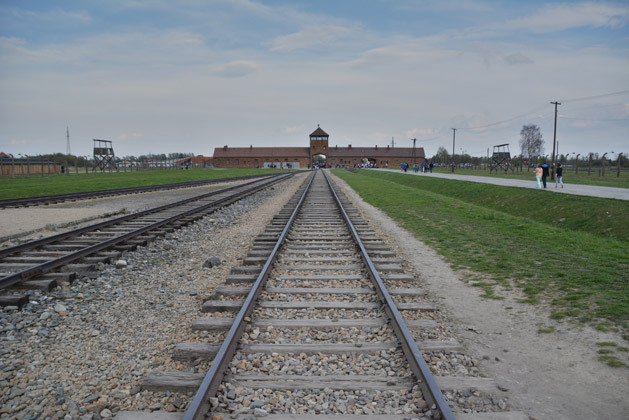 – Auschwitz did have a gas chamber where 60,000 or so people were killed, but the vast majority of the gas chamber deaths occurred at Birkenau where the Nazis built a much larger killing machine system, complete with a railway leading directly to the chambers. – Auschwitz has been mostly rebuilt, including its gas chamber, in order to show how the camp would have looked like during its active years. 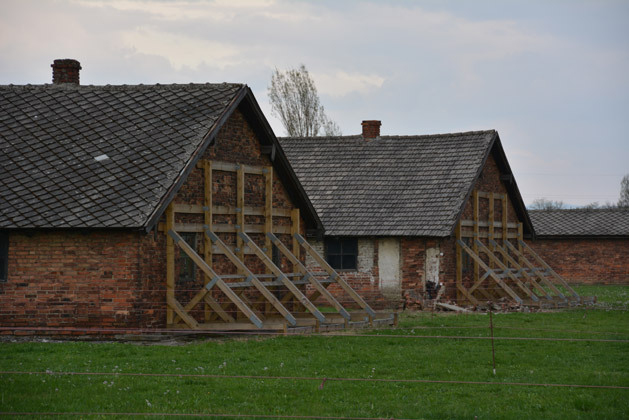 However, Birkenau has been basically left in the state it was found and has many buildings that were destroyed by the retreating Germans, have rotted away, or are slowly falling apart. The first thing I notice at Auschwitz is how unbelievably crowded it is. The majority of the crowds are student groups who seem to be from all over the world. I don’t think it’s a bad thing that it’s crowded here, but it definitely makes it a little tougher to see the exhibits with so many people. If I could do it over again, I would have visited here early in the morning right as it opened. The crowds at the Auschwitz I museum. 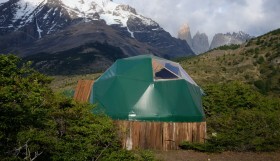 The museum is broken into several buildings, all of which used to be part of the original camp. 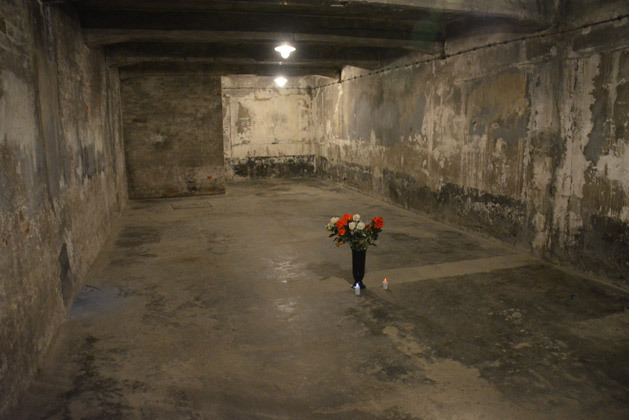 The buildings have all been renovated on the inside, but there are some original spots left, including some of the former “standing cells” where prisoners would be tortured by having to stand for days at a time. 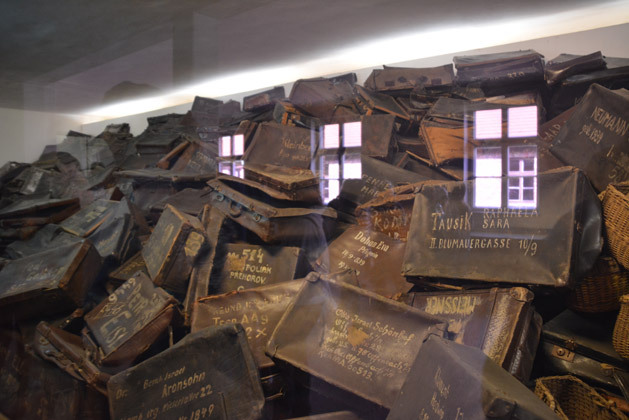 Suitcases of victims transported to Auschwitz inside the hall of proof. Victims were tricked into writing their names on the suitcases even though the nazis knew they would be killed soon. Thousands of eye glasses taken from victims. 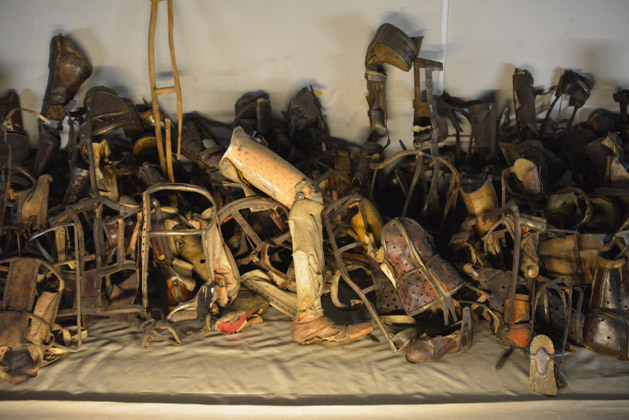 Artificial limbs of victims that would have certainly been killed on arrival. Victims were separated into those who could work and those who couldn’t. If someone was handicapped, they were sent directly to the gas chamber. 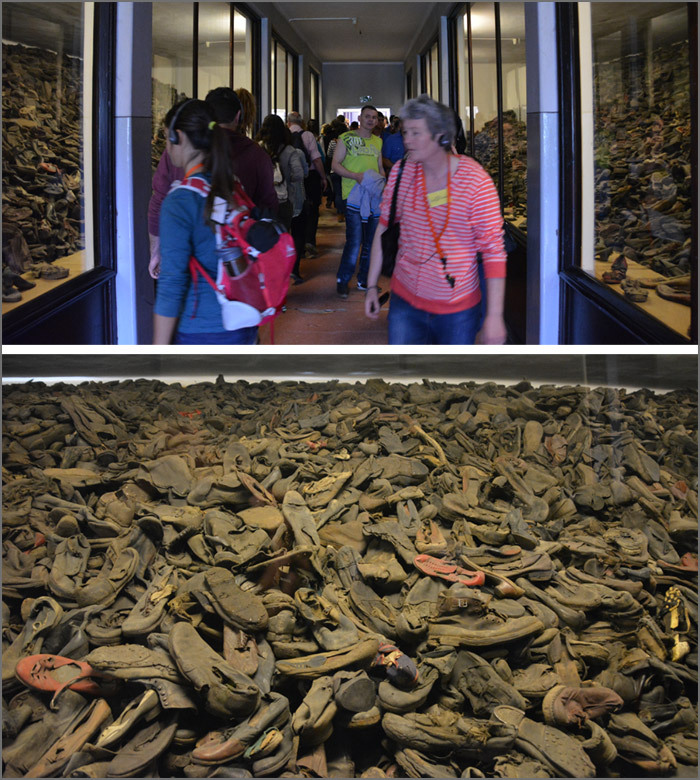 Over 80,000 pairs of shoes, stacked to the ceiling, on both sides of the hallway. All slowly rotting away. The glass in front of these exhibits make it difficult to photograph. 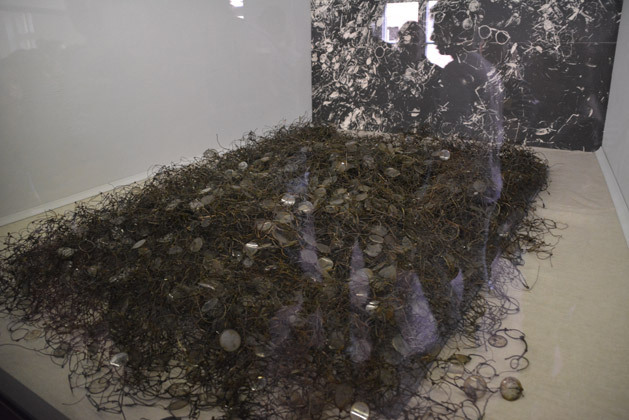 I was unable to get a decent photograph of what I would consider the most disturbing of the exhibits, the two-ton pile of hair. If you want to see a photo of the hair, click here. Inside the reconstructed gas chamber at Auschwitz I. Arriving at Birkenau has a completely different feeling than Auschwitz. There are no more crowds, and the camp is much more spread out and open. Unlike Auschwitz I, where the buildings have been restored, Birkenau has been left in its original state. The buildings that had been made of wood have all rotted away years ago, and all that is left of those are their brick chimneys. 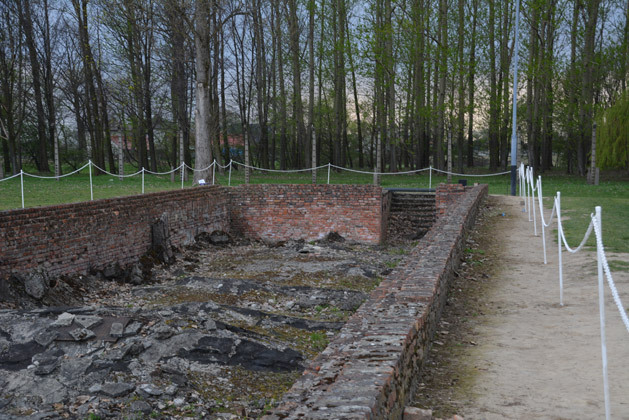 The remains of old wooden barracks at Birkenau. The end of the railway inside the Birkenau walls. Victims were brought directly into the camp via over-crowded railway cars. They would then be lined up and separated into those who could work and those who couldn’t. 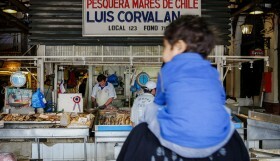 The ones who could work would last an average of three weeks before either starving or working to death. Those who were deemed unfit for work were sent directly to the back of the camp, to the gas chambers, and killed immediately. 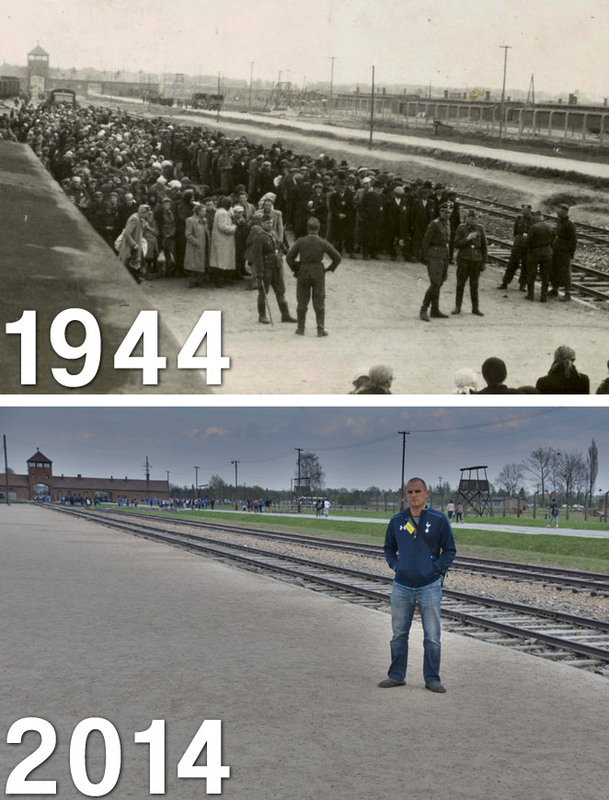 Then and now: The selection area at Birkenau. 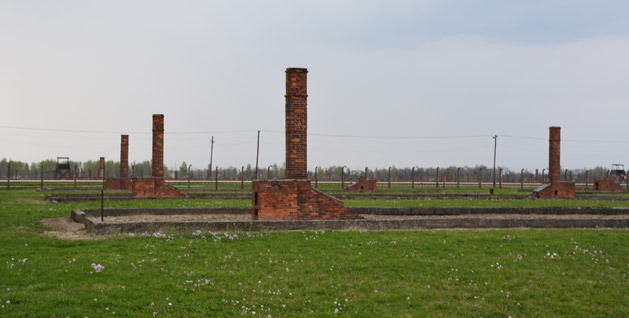 There were six working gas chambers at Birkenau. 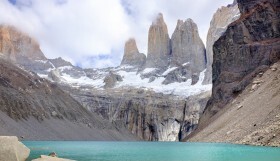 They were destroyed by the retreating Germans, and were left alone after the war. It was decided to let them fall into ruins instead of trying to restore them. They also did not want to tear them down and remove them in fears of revisionists who still try to deny anything ever happened here. Both chambers have had their roofs collapse, but the majority of the buildings’ ruins are still there. 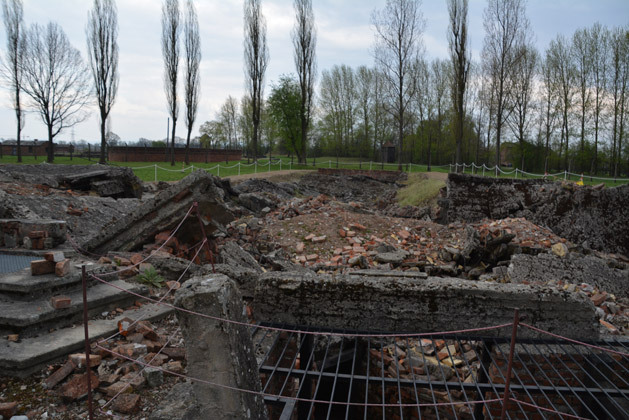 Ruins of one of two gas chambers at Birkenau. 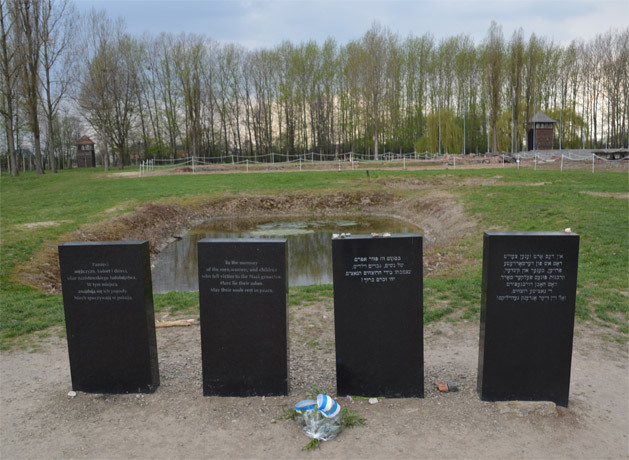 For me, there are three spots at Birkenau that are the most heart-breaking. The first is the steps leading down into the gas chambers. The steps are still there for visitors to see, and to me they symbolize the horror of this place more than anything else here. The steps leading into the gas chamber at Birkenau. The second site that is equally disturbing worth seeing is the pit where the remains of hundreds of thousands of victims were put. The pit was dug up by the nazis as they at one point decided to use the ashes to fertilize the nearby fields where food was grown. The ash pit at Birkenau. 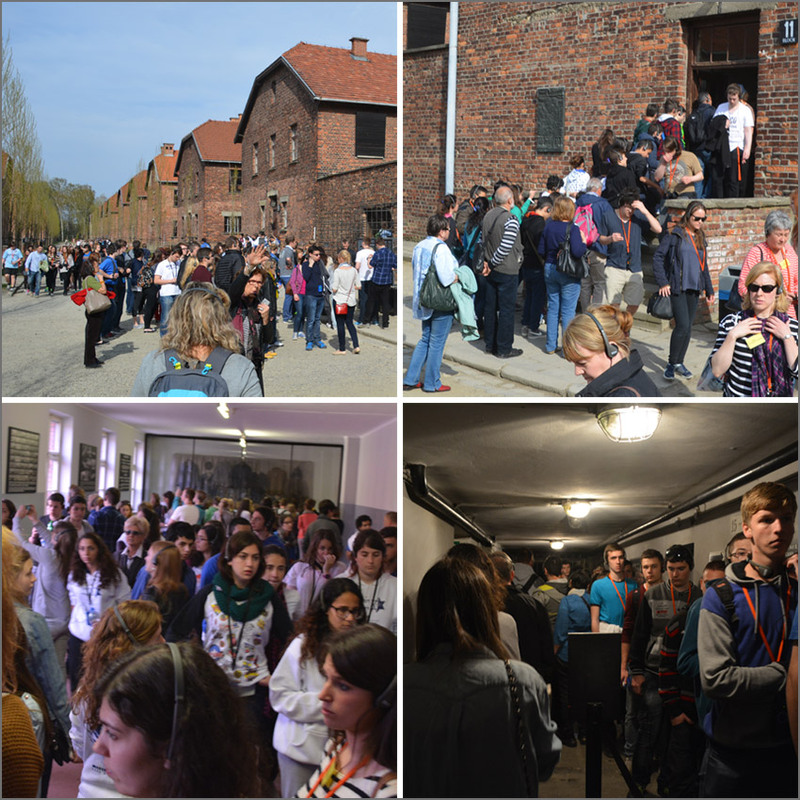 Our last stop in Birkenau is the inside of a barracks. Some of the barracks were built with bricks, and these are the ones that are still standing today. We went inside two different barracks, one that would have been used for women and one that would have been used for children. If you are familiar with the story of Anne Frank, then you might find it interesting to know that she was kept here at Auschwitz in one of these barracks for a while. She didn’t die here though, she died in a different concentration camp in Germany. 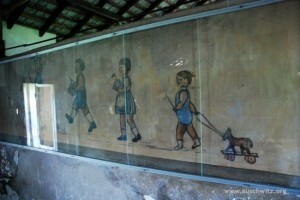 The children’s barracks has some original drawings on the wall made by children who stayed here. This is the third of the three spots I mentioned, and I think these drawings are the most tragic WWII “artifacts” left on earth. Just calling them artifacts doesn’t seem right, but what they really are is proof of a crime. It was too dark in there for me to get a good photo of the drawings, but to the right is a photo from Auschwitz’s website. 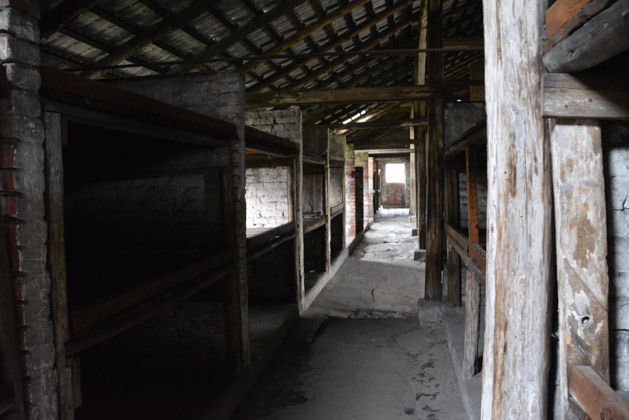 Inside a women’s barracks at Birkenau. I mentioned that Birkenau has been left alone. It isn’t completely accurate, since they have recently taken a few small steps to keep some buildings from falling over. You can see in the picture below that some wooden structures have been built as support for some of the barracks’ rotting walls. In the next 10 years, some really tough decisions are going to have to be made about what to do with this place. It can only stay in its current condition for so long before everything is just a pile of rubble. At some point things will need to either be covered in big glass structures, or removed completely. It is why I don’t mind the large crowds here. The more people that can see this with their own eyes, the better. There are too many lunatics out there who try to claim this never happened. Once these buildings are gone, we need to ensure future generations still know exactly what happened here, as horrible and disgusting as it is to talk about. The men’s section of the camp as seen in the main tower. 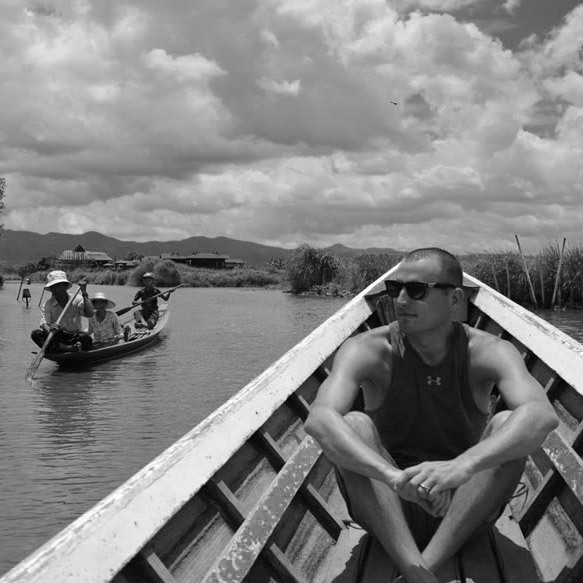 Reminds me of when I went to see where Cambodians were tortured and killed under Pol Pot. Human existence can be beyond disturbing. If I ever go to Auschwitz it’ll have to be first thing in the morning no doubt.